My brother needed to get some headshots done one day so I did his makeup and eyebrows then came along to watch and then we went downtown so he could get his passport done and his girlfriend met up with us. We then went down to the Eaton Center where I needed to find some casual everyday gloves (I didn't take a picture because I honestly forgot and they were just plain black boring) and a journal. I found the journal at Chapter's and I absolutely adore it! Unfortunately I can't find it on their website and I took off the sticker from the back but it's called the Henry the... and there was a number here but I don't remember which, XVIII?? Something of the sort. It cost around $15.99, which was right on my price point. 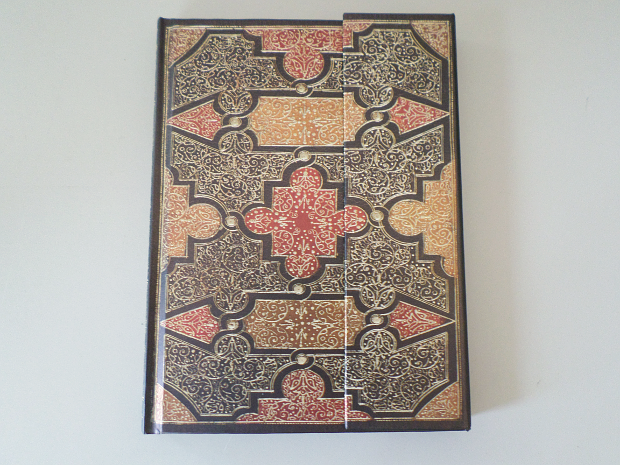 What I love about this journal is that it's hardcover (which is funny 'cause I prefer paperback books, but it's easier to write on hardcover) and that it has the magnetic closure on the side. I used to keep a diary when I was little and it's this awful pink and blue rose diary that has a lock on the side and I recently re-discovered it and read through it then wrote my own passage and realized how much better it made me feel! I decided to upgrade to a more grown up version, minus the lock. Although what I write in it is private, I trust my family and know they'll never get into it. If you're one of those people that holds in all their emotions, I definitely suggest starting up a journal. It's literally like a free therapist. Also, is anyone else notebook obsessed!? Literally it's heaven for me! I want to buy all of them, they're so pretty to look at, even if I know I'll never use them up. Next we went to H&M and I just grabbed a 2-pair of plain black gloves. I had a pair of red Olympic mitts from way back when but they're falling apart now and I wanted something simple I could wear when I walk the dog. They cost $5.99 I believe. Of course I gravitated towards the makeup section right away and I've never tried H&M makeup before but I can't imagine it to be the best, sorry. But they were having 50% off select makeup, so I decided to try out their nail polish, I think I heard a good thing or two. It's funny 'cause before the trip I was thinking about how I don't have a spring green nail polish and I really want one. Well, I got it! 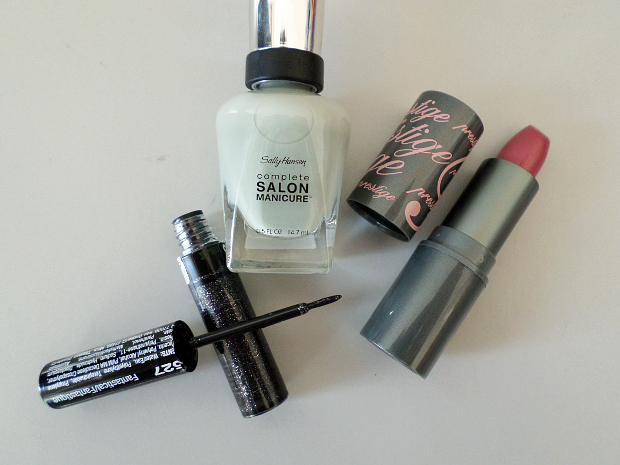 I won't be wearing this colour until the spring EXCEPT for one Christmas look I'll be doing. Have you ever tried H&M makeup before? What do you think? 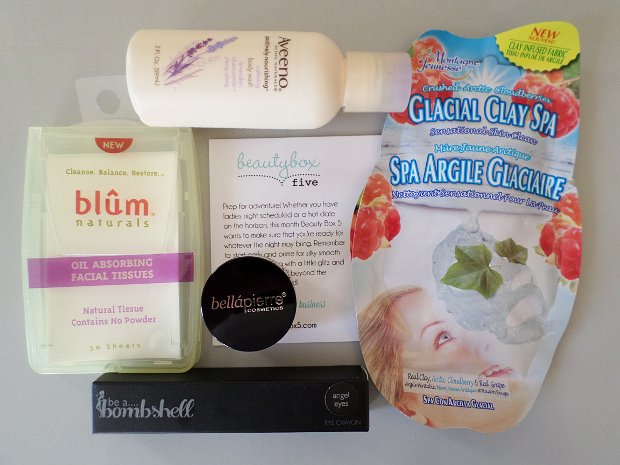 Yayayayay I love beauty boxes! Even if they're a disappointment, it's always fun to get a box in the mail. You get a surprise 'gift' every month. Have you received this box? What did you think? Hello everybody, long-time no-see! If you haven't noticed yet, I put A LOT of effort into my nails this week! I was trying so hard to focus and apply as carefully as possible so be proud lol. Also, Happy American Thanksgiving! Canadians have it in October but I think I'm gonna start celebrating the American one too just so I can have double the turkey dinner, it is my favourite holiday after all. Although, it kinda is hard to compete with Christmas. Speaking of Christmas, that's the theme I went for this week! I was gonna just do them all red, but then I thought 'Hey, there's snow on the ground and Christmas everywhere, might as well!' 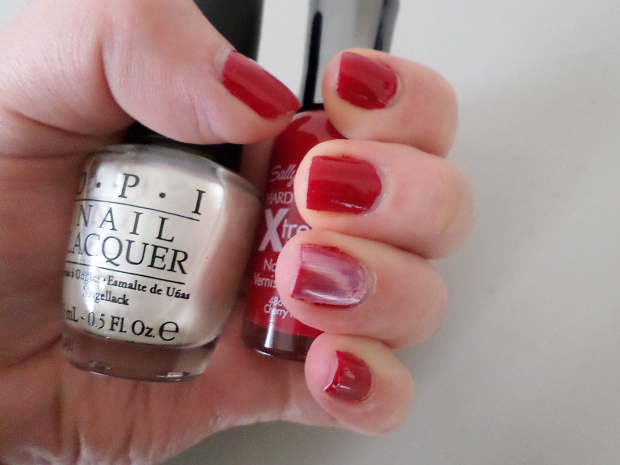 I painted over my entire nails using Sally Hansen Xtreme Wear in Cherry Red. 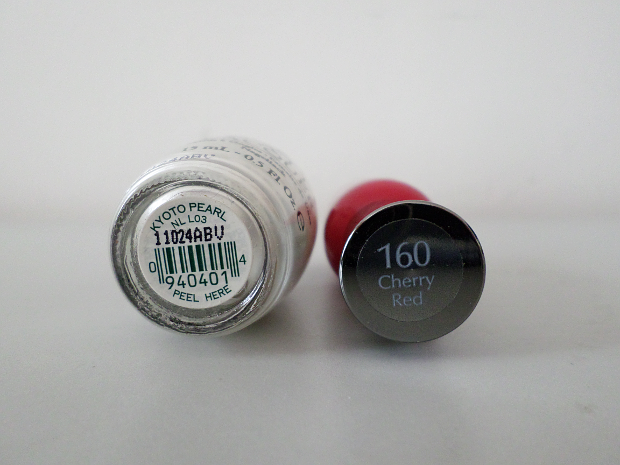 Believe it or not but this is my first 'true' red nail polish! I was in-store one day and saw it and realized that I don't have one of those! I love the Xtreme Wear collection, not only are they super reasonably priced but they have a great colour range and lastability. I also wanted to do something candy cane-ish and I knew I was going to use OPI's Kyoto Pearl but I wasn't sure what exactly I was going to do. I thought about straightening a paper clip and dragging it through the wet white to make the stripes, but a) too much effort and b) too risky, especially since the red was dry but still fragile. Then I thought I was going to paint the white stripes with the brush but I wasn't sure how they'd turn out and if I screwed up it'd be a whole mess. I took the easy route and just went over the entire nail in white. But, I did try to put on the thinnest layer possible and then I went over the nail a few times so the bristles would cause these little lines in the polish. It's barely visible but you can see it if you try hard. A few months ago I purchased the e.l.f. HD Blush in the colour Diva off of ftbbeauty.ca for $4. I've been planning to do a review for a while but just never came around to it, but here it is... finally! 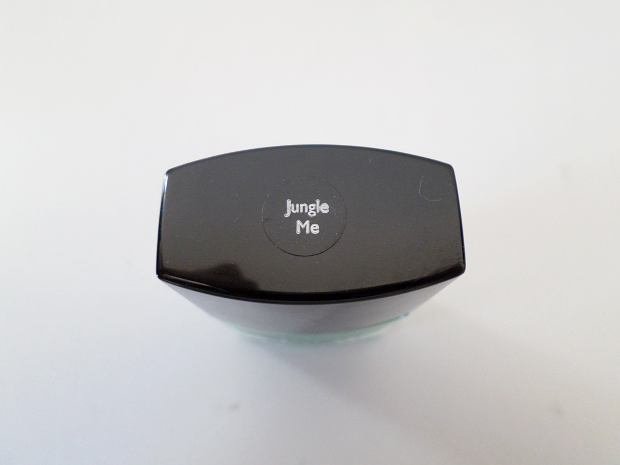 The blush comes in a 10ml (0.34 fl.oz.) bottle and has an easy to use pump. The amount is huge and 100% worth the price! I really like the packing, I think it looks sleek and professional. I love the matte black accents and I love the fact that it's in a pump, you don't have to worry about bacteria and you can easily control the amount you pump out. I also really love that the entire bottle is translucent so you can see the colour of the blush and you can see exactly how much you have left. 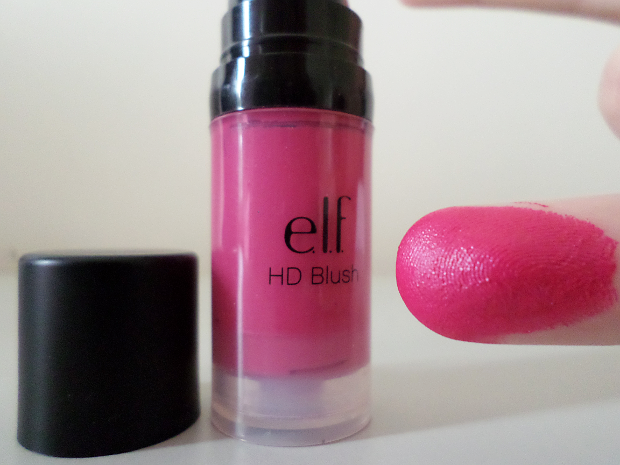 According to the description, the blush has a "Vitamin E enriched formula" and it "conditions and hydrates." I'm not concerned about it having Vitamin E, but after doing a little bit of research, I learned that it's an antioxidant beneficiary to the skin and eyes. Obviously this blush is not meant for the eyes, so that doesn't matter, but it's great that it's good for the skin! I'm sure there isn't a particularly significant amount in the blush, but even the little bit must make some sort of difference. The formula is very smooth and not too liquid and not too thick, it's just perfect. I have a bit of a love-hate relationship with this formula. This will probably sound ridiculous but the formula is literally too pigmented! It is so strong and bright that you really need to take the most care to not apply too much or you'll look like a clown. I kinda like using up my products and moving on to new ones, but I just know that this will last me forever and more. If you're one of those people that wear very little makeup and only own 1 or 2 blushes, this would be a great match for you. I like to pump out a tiny bit onto my hand, tap a large duo fibre brush into the blush and then carefully apply it to my cheeks. 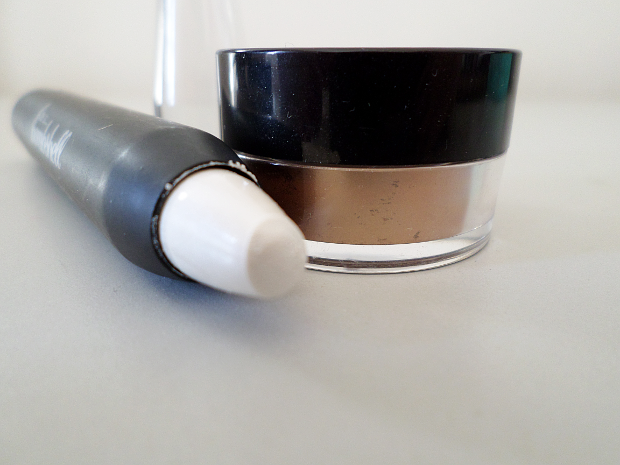 It blends out wonderfully and dries to a matte finish. I've worn it all day long and it did not budge a bit (which is why it's really important you're careful when applying). 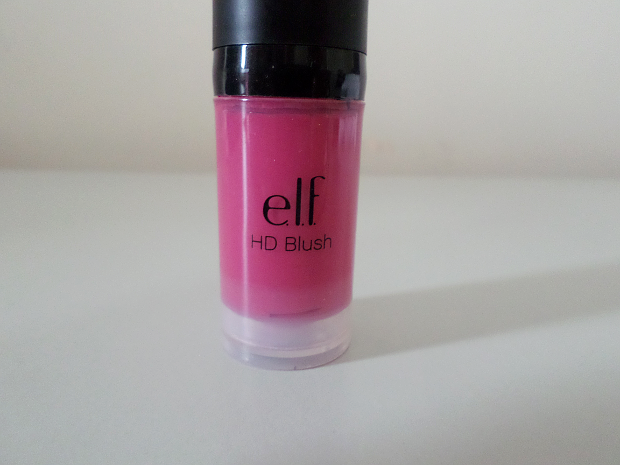 It easily removes with some soap and water, which I think it very important for such a bright, pigmented product. I've used this blush as a lipstick as well and it works wonders! I don't have to worry about using too much, I just pump out a bunch and apply it and it dries super nicely and leaves a gorgeous bright lip. Hope you found my review helpful! Hey everyone! 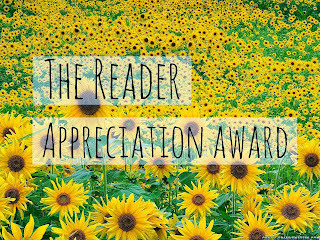 So the lovely Sarah from SoItsSarah has tagged me for The Reader Appreciation Award (about a month ago but shhh...) Thanks, Sarah! Let's get to it, then. - Include the award logo somewhere in your blog. - Answer 10 questions (detailed below) about yourself, if you want to. - Nominate 5-10 blogs that you love. Or you pick the number. - Contact the nominated bloggers to let them know. - Thank the blogger(s) who nominated you with a link in your blog. I'm not sure whether I'm supposed to pick my own questions or what, so I'll just answer these. Stretch your left arm out and grab the closest thing to yo. When did you last go outside? Around a half hour ago to walk Azor around the block in his cute 'firefighter' rain coat. Ohohoh, Europe - preferably Czech Republic, Poland, Scotland, Ireland, England, Sweden, Holland. Anywhere, really. Eh, I've lost track of the days of the week. I waaaaaaas, but not right now. Last song I listened to is Grow Up by Paramore. Grab the nearest book to you, turn to page eight and find line four. Is there anything happening this weekend? I went to Ikea twice and bought way too many candles and chocolates. A few weeks ago when we had the inspection at home, my mom, Azor and I went out to this all-day breakfast place (which was delicious), and then we stopped by Rexall 'cause we had nothing better to do while we waited. Mom waited in the car with Azor while I went in for a few minutes and browsed the aisles as I've never been to Rexall before. I was hoping they'd be carrying Wet N' Wild as I've been dying to try their lipsticks for quite some time, but I was out of luck. But, I did spot a small rack hidden away with the Wet N' Wild 2013 Halloween Collection. Out of everything I decided to just grab the Fantasy Makers Glitter Eyeliner in the colour Fantastical. I don't remember the exact price but it was around $2.13. It's funny that I chose this product because a) I already have a black eyeliner, b) I hate liquid liners and c) I hate brush (vs. pen) liquid liners, but I chose it to wear over top my black gel liner. I've worn it a few times already and I just love it, it adds such a nice sparkle to the eye. I somehow have this radar inside me that knows exactly where the sale section is, so obviously I went to investigate. I was surprised at how organised and good the sale section is compared to Shopper's; it was a lot neater and well-stocked with makeup. This brand is called Prestige (I actually thought it was Too Faced at first 'cause the packaging and font is so similar). The lipstick was on sale for around $2 and it's a beautiful metallic rosy pink called Berry Fantasy, a colour lacking in my collection. Lastly I picked out this Sally Hansen nail polish in the colour Pumice. I've never seen such a colour before and I think it's so lovely! I think it'd be great for any season. I've actually already worn this colour and it is a bit more green than pale but it looks so lovely and unique! It was also $2. Also, quick update: I got the job at The Body Shop! Major discounts: here I come!